IT leaders and their teams now face tougher challenges. Consumers are shifting their activities online and businesses are scrambling to cope with these changes in the market. Companies now understand that they have little choice but to “go digital or die,” and much of the pressure to make this happen falls on IT teams. 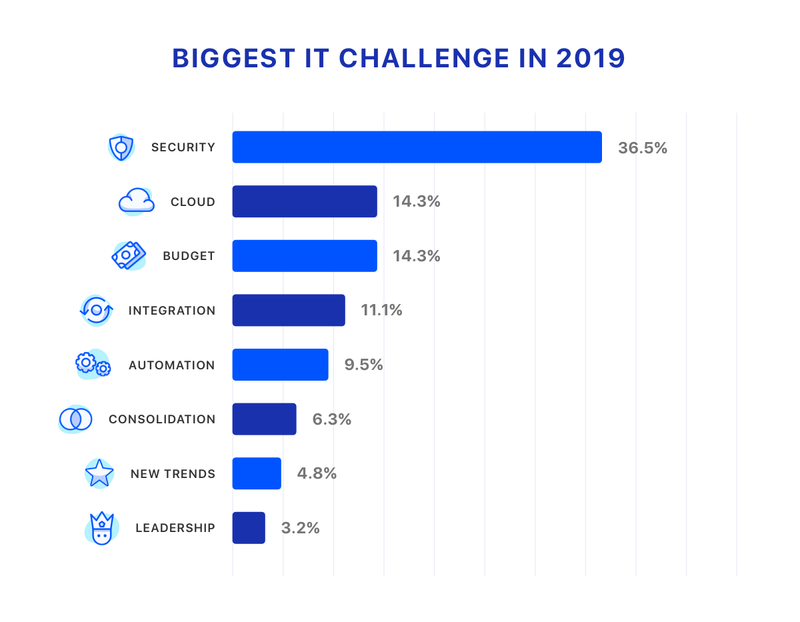 A recent survey of more than 300 IT leaders by software-as-a-service (SaaS) management platform Torii revealed their biggest challenges for 2019. Taking the top three spots in the list are security (36.5%), cloud, and budget (both at 14.3%). Security being a top concern echoes what has already been raised by most experts and pundits. According to security firm Symantec, 2018 saw a rise in security breaches, data theft from cloud storage, and enterprise ransomware. These threats are expected to persist throughout 2019. Experts are also warning organizations to gear up for new forms of attacks. In an interview, Diane Rogers of IT management platform Cloud Management Suite, predicts that internet-of-things (IoT) hacks, artificial intelligence-driven attacks, and even data protection law-based extortion will be the key emerging threats to be wary of this year. Torii's survey showed that IT leaders’ security worries also stem from their digital transformation initiatives. The affordability and ease through which SaaS applications can be acquired allows employees to readily acquire subscriptions. However, the introduction of these new technologies can bring about certain risks. The increase in use of SaaS applications is creating “shadow IT” within organizations where employees use their personal accounts and other unauthorized services for official business. Because of shadow IT, company data can get siloed inside accounts to which no one else in the company has access. The isolation of the data stored in such accounts creates gaps in data protection and integration. The use of unauthorized applications could also expose companies to non-compliance to data protection laws and regulations should these applications and services get breached. Cloud computing is also creating new tasks for IT teams to handle. As more workloads get shifted to the cloud, IT teams find themselves taking on the additional responsibilities of migrating their existing workloads and managing cloud services. Yet, only 28% of IT leaders claim that they use SaaS management tools to help them. These are all on top of maintaining their respective on-premises infrastructures. IT leaders are also concerned with managing limited budgets. One in four respondents claim to be focused on maximizing user efficiency and seeking additional funding as workarounds to budget constraints. The cost of unregulated SaaS subscriptions can also add to this burden. IT departments must be able to accurately track the number, length, and costs of each SaaS subscription charged to the company. The global trend points to companies spending more on IT in 2019 with Gartner estimating that IT spending will reach $3.8 trillion this year. So, it would be interesting if IT leaders would see their budgets and requests for additional capital realized. The Torii survey also showed the various measures IT leaders are taking to address these concerns. Most are looking into new tools such as Okta for identity management and Mimecast for email security and data protection. They are also planning to rework their policies to include new employee rules concerning use of IT resources, better cloud governance, and more training. Mohammad Farooq is a seasoned blogger who writes about a range of Technology topics and digital solutions for business. He regularly blogs about digital transformation in his new blog, DigiTortoise.